on the width. The back seam either has an overlapping style or a fin style, like a potato chip bag. Cellophane was created as the result of a failed invention. As the story goes, it all started in a cafe in France, around 1900. A Swiss chemist named Jacques Edwin Brandenberger, witnessed a glass of red wine being spilled on white tablecloth. He wanted to create a tablecloth with stain resistance. That design failed, the cellulose gel, aka Rayon, did adhere to the cloth, but, it also made it too stiff and was not very durable. Ultimately, that gel became a clear flexible film in itself. In 1912, he coined the term “cellophane,” taking the first syllable of cellulose and pairing it with the last syllable of diaphane, which is Greek for transparent. That same year, Whitman’s Candy Company introduced it’s infamous, Whitman’s Sampler, and became the first candy company to use Cellophane to wrap its box. In Layman’s terms, true Cellophane is a thin, clear and flexible material made from paper pulp. Today, the term cellophane is used more generically to identify a bag or overwrap that is clear and crinkly. However, most of today’s packaging uses petroleum based poly olefins known as Polyethylene, Polypropylene or Polyester, either by themselves or laminated together. Each brings different features and benefits. In 1923, DuPont acquired the rights to the Cellophane patents for use in the United States. Several years later, chemists created a lacquer, or coating, that could be applied to the Cellophane, and make it moisture-proof. This coating limited the amount of Water Vapor transmission through the film. This was a turning point for Cellophane. It was now a barrier film, and helping to increase the shelf life of many food products. Over the next 30 years, Cellophane production increased every year. Other companies, like Olin, began producing Cellophane. At its peak there were 5-6 plants in the United States. By the time the 1960’s came around, Cellophane in flexible packaging was being replaced by a trio of plastics, Polyethylene, Polypropylene and Polyester. These polymer based materials could be produced faster, and at lower cost than Cellophane. By the 1980’s, the writing was on the wall and the heydays of Cellophane were over. DuPont would sell its Cellophane plants, and focus its attention to plastics, primarily Mylar, its brand of Polyester. Today, there is only one plant producing Cellophane in the United States and one plant in England. In 1952, 19 years after the invention of Polyethylene, Polypropylene was invented. Polypropylene, Polyethylene and Polyester are the most widely used materials in flexible packaging today. Each provides varying attributes in terms of price, seal strength and barrier protection. These polymers are petro-based, think oil. When refined and hardened produce what is known as resin. Resin looks like little plastic pellets. These pellets are heated making a thick viscous, like melting chocolate chips. 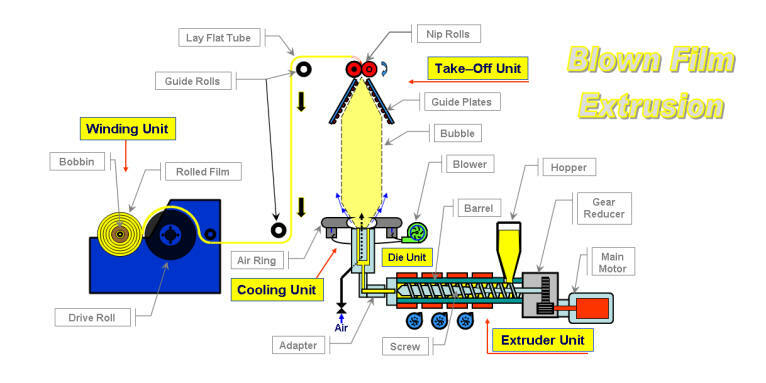 In a process called extrusion, the viscous is pumped to extrusion lines. There are two types of extrusion processes, blown and cast. Blown refers to using a die to create and blow the viscous into a bubble. The thickness of the bubble wall determines the gauge of the film. The bubble is then slit to size and wound onto cores. This process is primarily used for making Polyethylene in the United States. In Asia and other countries, this process is commonly used for making Polypropylene. Blown Polypropylene is used make tube style bags. Cast extruding takes the viscous and, instead of blowing a bubble, it is fed through a flat die and cast into a flat sheet. The sheet is then pulled over cooling rollers, the speed of the various rollers even the film to a consistent thickness. The Cast sheet is then wound onto rolls. Cast Polypropylene (CPP) is commonly used to make sideweld bags. Oriented Polypropylene (OPP) takes the Cast sheet one step further. While the sheet is being cast over rollers, it is being stretched in machine direction. Next, a tenter frame grabs the edges of the sheet and begins stretching the film in the transverse direction. The 30-40” wide cast sheet ends up being 60-70”. In the process, the polymers are oriented, creating a consistent alignment. Imagine a pile of spaghetti noodles being straightened and aligned into a basket weave pattern. The finished rolls are then taken to coaters. There are a variety of coatings that can be applied and all serve different purposes. A layer of Polyvinyl Dichloride (PVDC), aka Saran, might be added to give the film an oxygen barrier or Acrylic for enhanced optics. Both coatings are also heat sealable to themselves or the other. The film may also be Uncoated only requiring a sealant layer to be added to one or both sides. 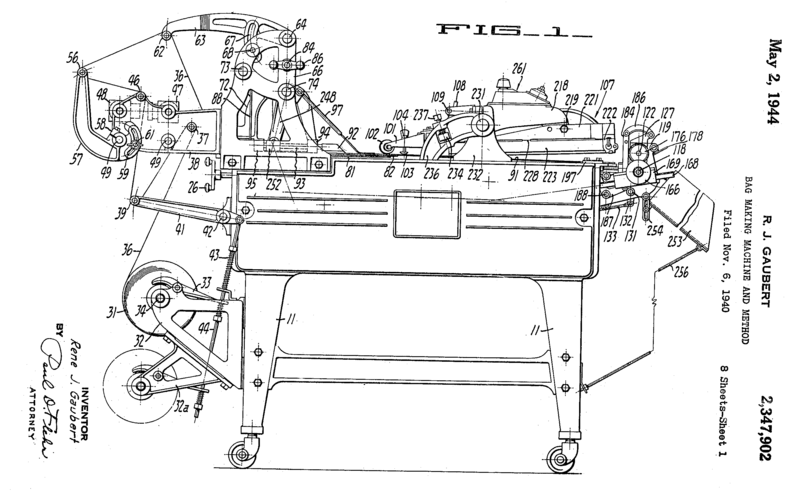 Simplex machines were designed by FMC Corporation around 1940. In fact, Atlapac’s old machine was manufactured in 1941. The machines are about 5 feet long and 18 inches wide. They are comprised of 1940’s technology of gears, cams and cranks. The only modern updates are thermostats, controls and electronic eyes for converted printed film. Cellophane or OPP rolls are hung on the back of the machine. The film is woven through a variety of rolls to maintain tension. The film is then formed around a metal plate with the edges overlapping in the middle, this creates the Back Seam. Before the film advance the bottom seal is created, at the same time, the previous bag is cut and finished. There are two types of bottom seals. Depending on how the machines were designed, they could make a Foldover Bottom seal or a Crimp Bottom seal. A Crimp Bottom seal creates a heat sealed tail below the usable portion of the bag. A Foldover Bottom takes the crimped seal and folds and seals it to the back of the bag. Simplex machines were designed to convert Cellophane. Cellophane has excellent dead fold properties, similar to folding a piece of paper. While OPP has replaced Cellophane in most markets, the Simplex machines often struggle to convert it, especially the heavier gauges, 1.6mil and above. This is primarily due to the memory of OPP and lack of good dead folding properties. On the Simplex machine, the film advances every second. As such, it doesn’t stay wrapped around the forming plate long enough to retain the flat shape. Converting films with heavier gauges, or bags with small gussets can prove problematic. Simplex machines have not been made for 40-50 years. The Simplex machine is the only machine capable of making a Foldover Bottom seal. Using today’s technology of computer controls and servo motors, High Speed Crimp Bottom machines have replaced the Simplex Crimp Bottom machines in the marketplace. Where the Simplex machine struggles to convert OPP, today’s machine excel. Today’s machines are between 20 – 25 feet long. With that extra length, multiple seal bars, a chiller section, larger forming sections and flatteners have all been added to create a superiorly constructed bag, compared to the Simplex machine. The bags come off flatter and more precise, meaning smaller boxes can be used. Smaller boxes mean less warehouse space is needed to store. The flatness, also, gives these bags the ability to be fed through automatic labeling equipment.